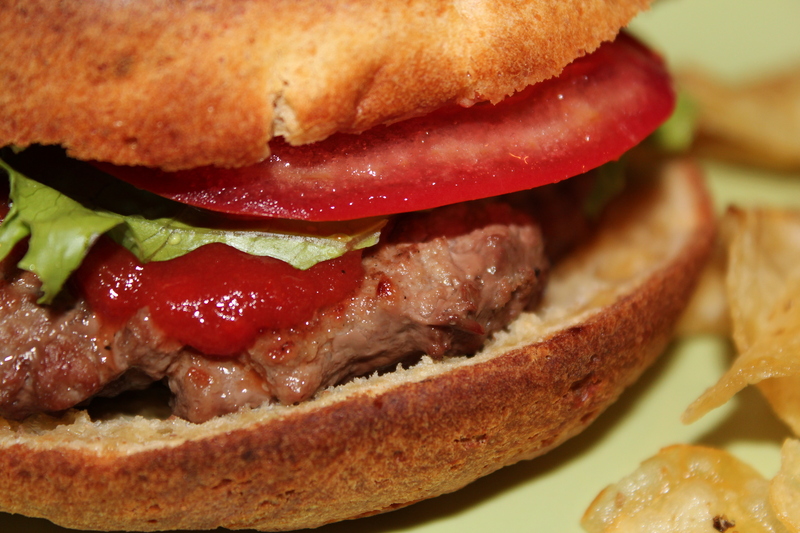 In Part 1 of my hamburger saga, I had successfully created a yeast-free, sugar-free bun. Now I just needed some ketchup without vinegar (being yeast-free includes avoiding vinegar), onion or cane sugar in it because a burger just isn’t a burger without that condiment. First I started by checking out supermarkets and health foods stores…although I struck out with finding a brand that met my criteria. So back into the kitchen I went. I started with a recipe without vinegar and gave it a try although the consistency did not turn out the way I wanted. So I tried again, changing the amounts of liquids yet keeping all of the flavors. My second attempt was successful! That night SensitiveHusband grilled us each a hamburger. I loaded mine with lettuce, tomato and ketchup, all sandwiched between a fresh, homemade bun. My meal tasted so good, and I was proud of myself for not letting these food sensitivities get in the way of my summery treat. Mix all the ingredients in a bowl and serve. I am also sharing this recipe with Simply Sugar and Gluten Free, Balancing Beauty and Bedlam, Everyday Sisters, This Chick Cooks, Lady Behind the Curtain, Miz Helen’s Country Cottage and Food Trip Friday. This entry was posted in Recipes - Condiments, Recipes - Entrees and tagged Cane sugar free, Hamburger, Ketchup, Onion free, Yeast free. Bookmark the permalink. Home made hamburger is the best! Yum! Visiting from Food Trip Friday! Your burger looks so good and the Ketchup look great! That is a really good recipe for Ketchup that I will sure give a try. Hope you are having a wonderful week and thanks so much for sharing with Full Plate Thursday.